They can be purchased from Wicklow Chamber office, as well as from Bridge Street Books and Connolly Menswear. A vital area of the Chamber’s work, bearing in mind the ‘living heart’ of the town, is to revive the retail business here, and encourage more local shopping generally. The Chamber continuously works hard to promote the “Shop Local” principle. 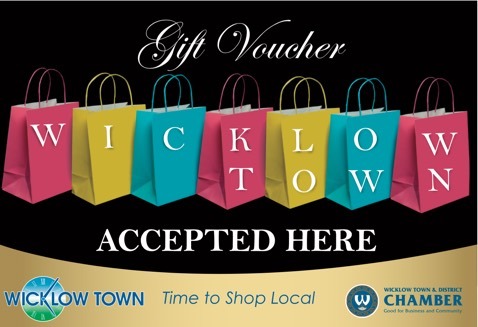 Wicklow Town & District Chamber of Commerce has a high-quality, prestigious Chamber Shopping Voucher, which is beautifully presented in a purpose-designed sleeve, making it a fabulous gift to receive. The Chamber is strongly encouraging all to ‘shop local’ and support local shops, restaurants, coffee shops and support local employment. All employers are being reminded that, under current revenue rules, employers are permitted to give up to €500 worth of vouchers without any tax implications for either. Businesses in the locality should also consider the vouchers as gifts for valued customers of theirs, instead of the usual ‘bottle or biscuits’.